Description: As part of "2012: A Kubrick Odyssey" - a complete chronological series of Kubrick entire filmed oeuvre - the Los Angeles County Museum of Art screens the filmmaker's 1964 black-and-white comedy of an unauthorized nuclear attack that could trigger a "Doomsday" weapon that will destroy the earth. 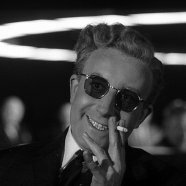 Though only marginally "science fiction," Dr. Strangelove, Or How I Learned to Stop Worrying and Love the Bomb is a brilliant piece of "speculative fiction" that follows its nightmare scenario to a conclusion that is at once chilling and hysterically funny. The feature film will be followed by a free screening of the brand-new short documentary Stanley Kubrick In Focus (2012/color and b&w/29 min./HD). LACMA invites viewers to make a reservation for the the pop-up dinner opportunity before the screening. Tickets to the Bing Theater are $10 for the general public; $7 for LACMA members, seniors (62+), and students with valid ID; $5 LACMA Film Club members and Academy members with valid ID. "2012: A Kubrick Odyssey" is presented conjunction with LACMA's Stanley Kubrick exhibition, which runs through June 30, 2013.